I love making bagels; ok it’s a slightly convoluted process but they make me feel like a real, proper baker! When I saw a picture of some marmite bagels on the cover of Olive Magazine, I just knew I had to make my own version. Big S loves bagels and marmite and isn’t so keen on sweet breakfast options – these bagels could have been made exclusively for her! 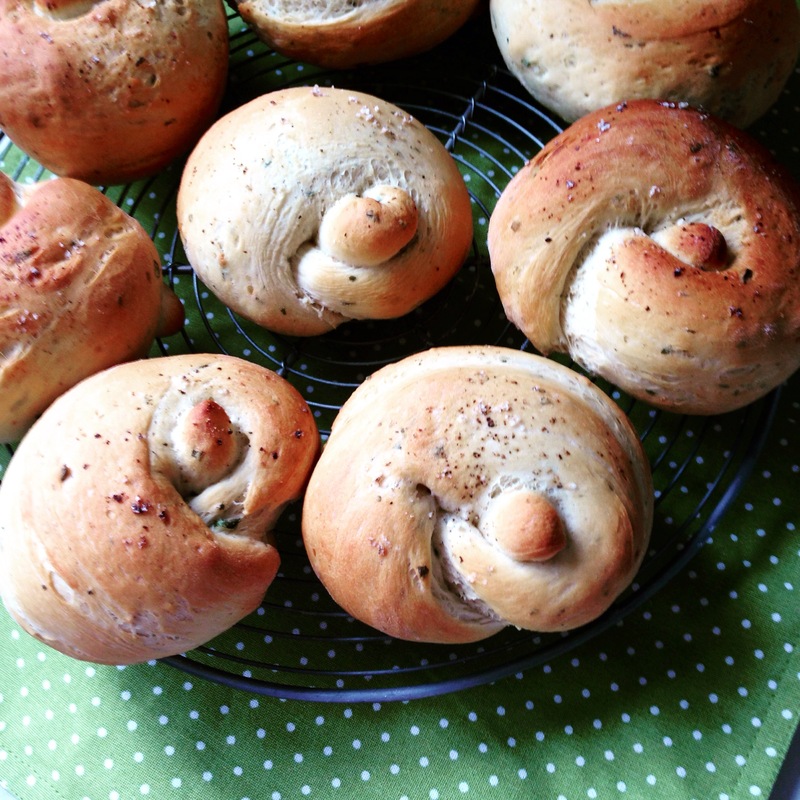 They really are a delicious savoury bagel variation – certainly not too ‘marmity’ but with add oomph and umami flavours, these certainly aren’t a bland plain bagel! Don’t worry though, if you’re not a marmite fan you will still enjoy these, they’re more savoury and moorish than overpoweringly marmite flavoured. We had them warm from the oven with Tofutti better than cream cheese, served with carrot soup – a complete winner of a lunch! But make sure you leave some for breakfast, toasted and with added marmite if you’re a real marmite addict! Sift the flour into bowl; add the salt, sugar and yeast. Place in a lightly oiled bowl, cover and leave to rise for about an hour, or until doubled in size. Bring a pan of water to the boil. Cut the dough into ten equal sized pieces, weigh them if you want them to be exact. Heat the oven to 220 degrees centigrade/gas mark 7. Oil a baking sheet. Brush with the marmite infused dairy-free milk and sprinkle with the salt. Mmmm, is there any more comforting and wonderful smell that cinnamon scented baked items cooking in the oven? It’s such a sweet, warm and cosy aroma, with the promise of an irresistible treat nice the baking has finished. This cinnamon swirl brioche loaf hits the spot in so many ways – it looks stunning, smells amazing whist its cooking and tastes absolutely delicious – you can’t go wrong with that!! I always find the brioche loaves and rolls look tempting on the supermarket shelves, to me they look rich, delicate and indulgent. A sort of luxury loaf for times of celebration. 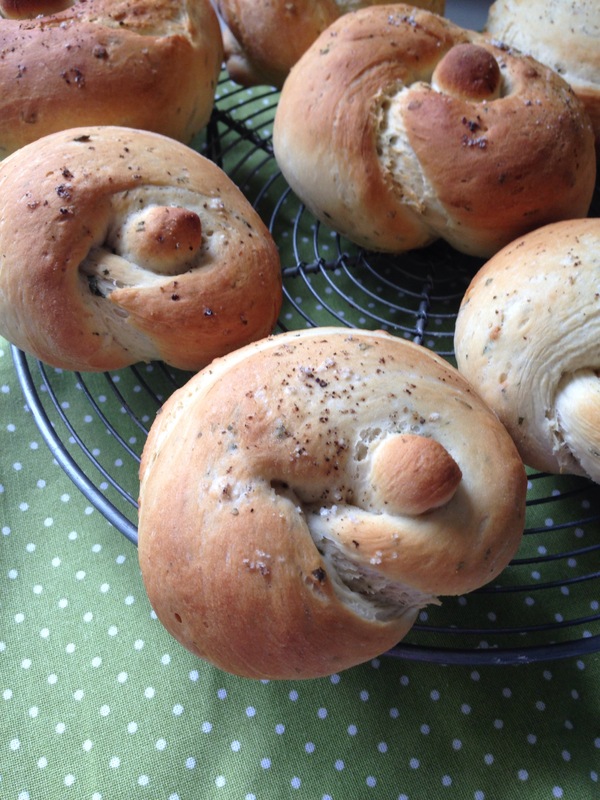 Obviously free from brioche are pretty hard to come by with their reliance on eggs and butter to enrich the dough! This recipe is pretty simple but gives beautiful results – the dough is enriched enough to be luxurious without being sickly, there is just a hint of sweetness in the dough, with the sugary cnnamon swirl giving the favour punch. We loved the slices plain, toasted or turned into a luxurious bread and butter pudding. I also fancied making a show stopper loaf, one with ‘bake off’ worthy wow factor. I’d seen this technique of splitting and twisting the dough before and thought how stunning the results are for a technique which is essentially totally simple and straightforward. The swiss roll style spiral of cinnamon filled dough is basically split into two lengthwise with a little join left at one end. The two sides are then twisted so the cut edges face upward and then it’s twisted over itself giving a wonderfully gnarly and twisted effect, especially once risen and baked. I think we definitely ended up with the ‘wow effect’ I was looking for! Mix together the 1/3 cup of sugar and 1tbsp cinnamon and set aside. Knock back and then roll into a large rectangle. Sprinkle over the sugar and cinnamon and then roll up into a tight swiss roll type cylinder. Split in half lengthwise leaving a little join at one end. Turn the cut sides up so you can see the cinnamon sugar layers. Twist and then join the ends. Place in a loaf tin, cover with cling film and leave to rise again for another 30 minutes Mix together the glaze and set aside. I do like making us some interesting bread for a weekend lunch – it makes such a welcome change from the boring sliced bread we’re normally forced to buy. Little S’s sesame allergy means all bakery products are out of bounds and the ready packed varieties are also few and far between. Our bread options get rather monotonous and I so like giving her the opportunity to try all types of gorgeous, fresh baked bread as there is not much better that warm home baked loaves. I found that if I make a bigger batch and freeze half then we always have something interesting to hand. This recipe provides a double whammy of interesting flavour coupled with shape.I think shape is just as important as flavour/smell in making something basic become special. I’ve always found knot shapes particularly appealing and whilst looking complicated, they are so easy to make. You effectively roll out a sausage shape but taper the ends slightly and then tie in a loose knot – simple! The garlic and herb in this recipe adds a subtle twang, enough to get the gist but nothing too overpowering, just as I like it. However, if you’re more of a garlic fan than me, add more and then you can crank it up as much as you like! Warm the oat milk, spread and syrup together until the spread has melted. Set aside to cool slightly. Sift the flour into a large bowl. Stir in the yeast and salt. Stir in the herbs and garlic, and a good grind of black pepper. Pour the milk mixture into the flour. 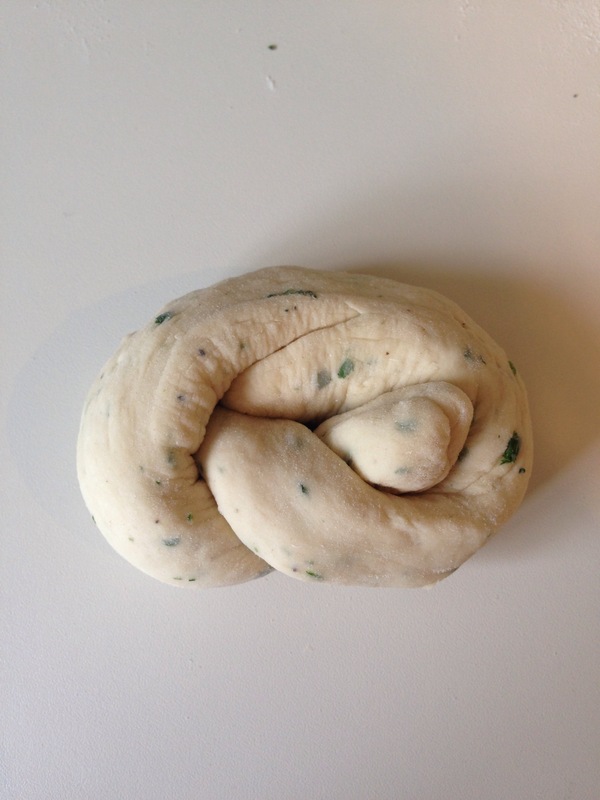 Mix until it has come together to make a soft dough. Turn out and knead for 5-10 minutes until the dough is smooth and springy. Place back in the bowl, cover with oiled cling-film and leave to rise for about an hour (it should double in size). 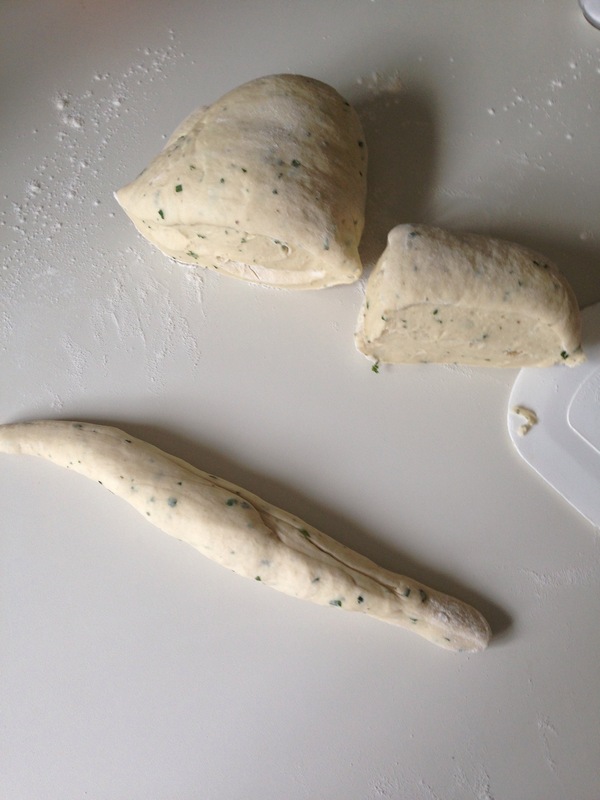 Once the dough has risen, knock back and knead again to form a smooth ball. Cut into 12 even sized pieces and roll each into a sausage with tapered ends. Tie in a knot and place on a lightly oiled baking sheet. Loosely cover with oiled cling-film and leave to rise for 30 minutes. Remove the cling-film. Brush the tops with oat milk and sprinkle on the salt and pepper. Bake for 15-20 minutes, until golden and sounding hollow when tapped. 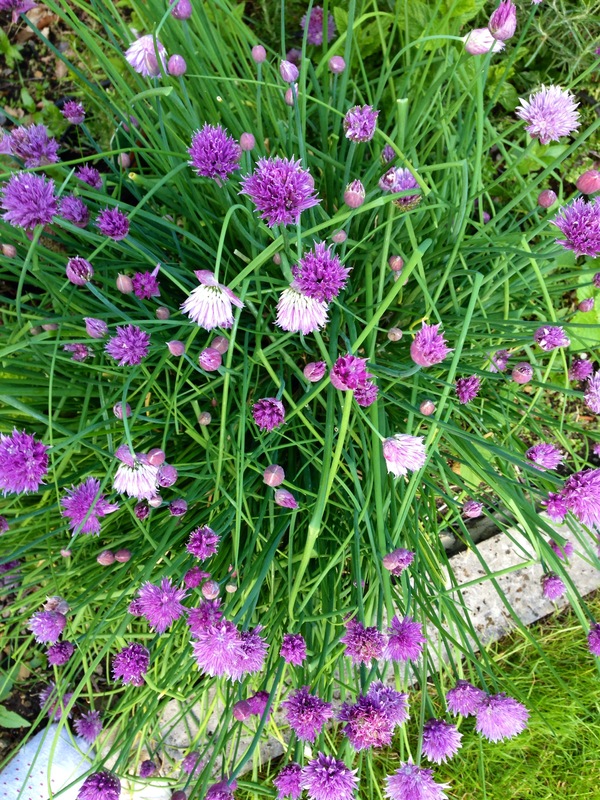 Our chives are growing like crazy at the moment and I’ve been using them wherever possible, but still not making a dent in the abundant harvest (much to the bumble bees’ delight as they seem to love love LOVE chive flowers). So it was a case of thinking up ideas of how to use as many as possible, in as many ways as I could! 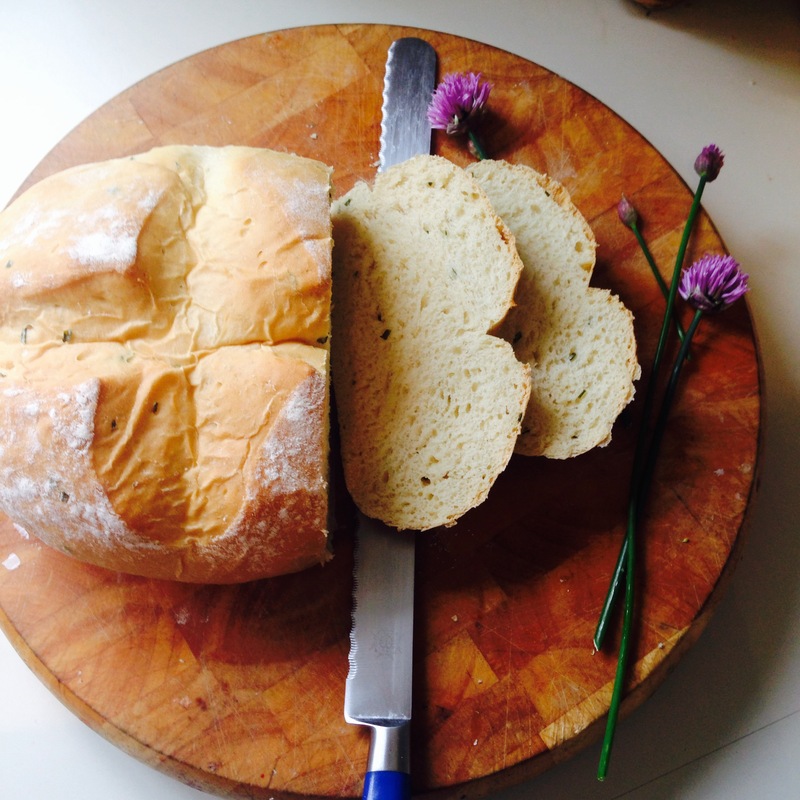 I was going to make a loaf anyway, to make our weekend lunches more exciting, so why not a chive loaf? 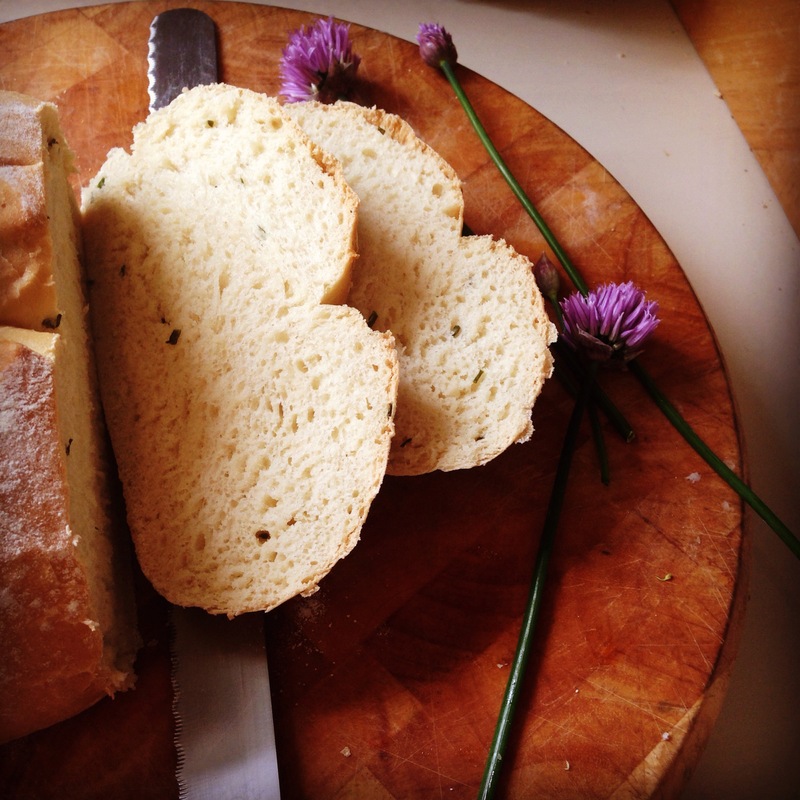 Now I don’t know about you, but I’ve never seen a chive loaf before, but why not? 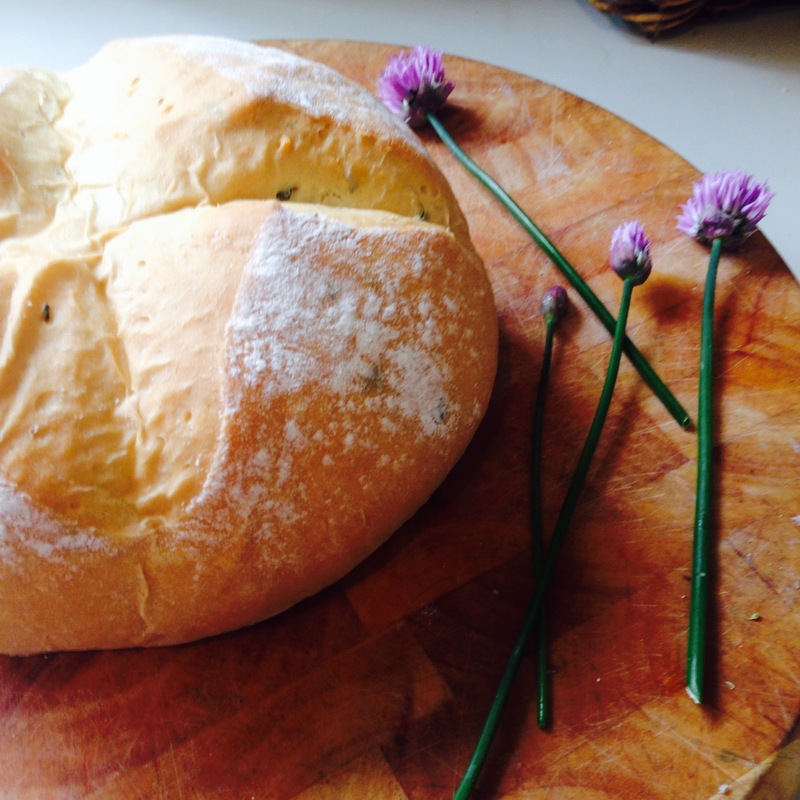 The mellow oniony-ness of the chives would surely give a lovely subtle savoury note to a traditional white bloomer, and white it had to be, the idea of chives in brown bread just seemed so wrong. 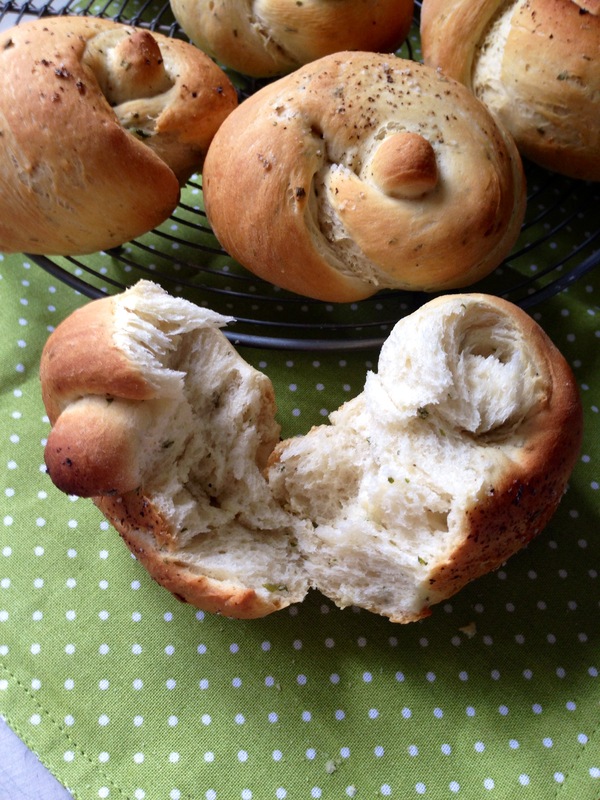 As it turns out, chive bread is very very good idea, perfect with a ploughman’s style lunch, in sandwiches or with a steaming bowl of soup (we had it with our family favourite tomato soup). Although, I’m not so sure it would work with jam on at breakfast time!! 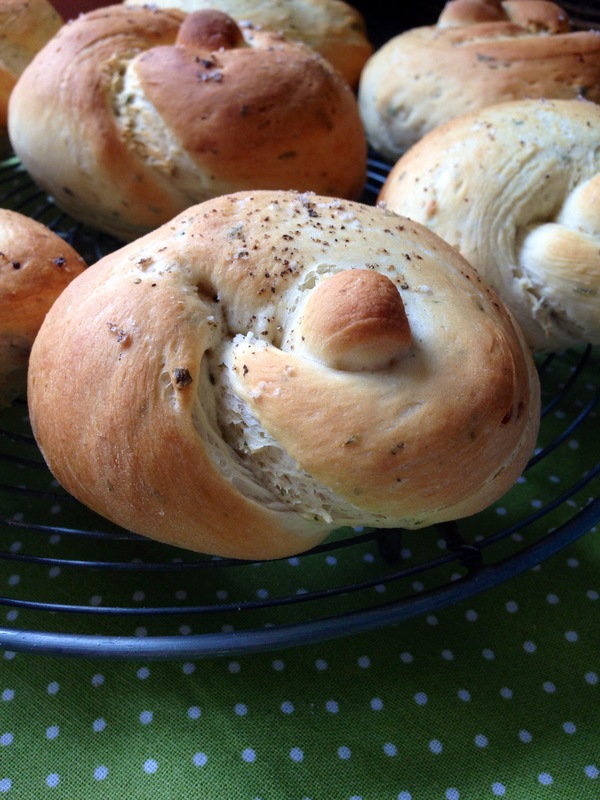 This is a particularly soft bread with a chewy rather than crusty outer. Rub the spread into the flour until is resembles fine breadcrumbs, stir in the soured cream. Add the salt, sugar, bicarbonate, yeast and chives. Pour in the dairyfree milk and bring together to form a dough. Knead for 5-10 minutes until smooth and silky and bounces back when pressed. Knock back the dough, form into a classic bloomer shape on a floured baking sheet (or any shape you like), sprinkle the top with a little flour and score a cross with a sharp knife. This will give the bloomer effect. Cover with cling film (oiled) and leave for another 30 minutes to rise again. Preheat the oven to 180 degrees centigrade/350 degrees Fahrenheit, bake for 20-30 minutes until golden and sounds hollow when tapped on the bottom.